I had a blast giving the commencement address yesterday as Ben graduated from Derby Academy in Hingham. It really was very special to be asked to do this with a son in the graduating class and I was very grateful for the opportunity. Of course I didn't say what I really wanted to communicate to the students upon finishing 8th grade: "Congrats! Now move out of the house and get a job!" As you'd imagine with the oldest co-educational school in the nation, there are many commencement day traditions. 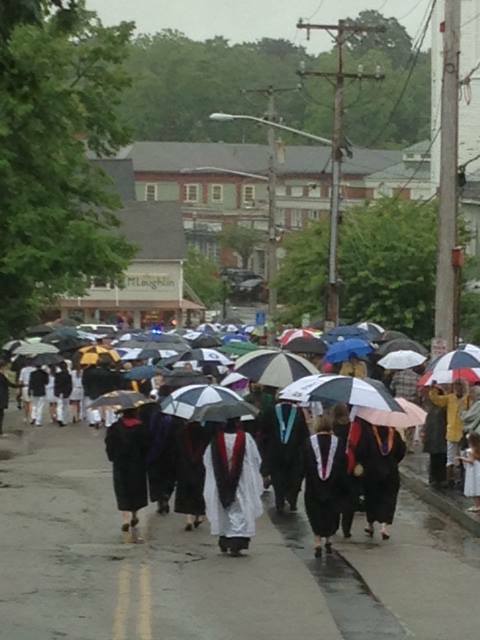 Each year on Derby Day the entire school processes down Fearing Road to the New North Church for the graduation ceremony. It happened to be raining but that didn't stop Head of School Andrea Archer from saying "busses be damned!" (or something to that effect). 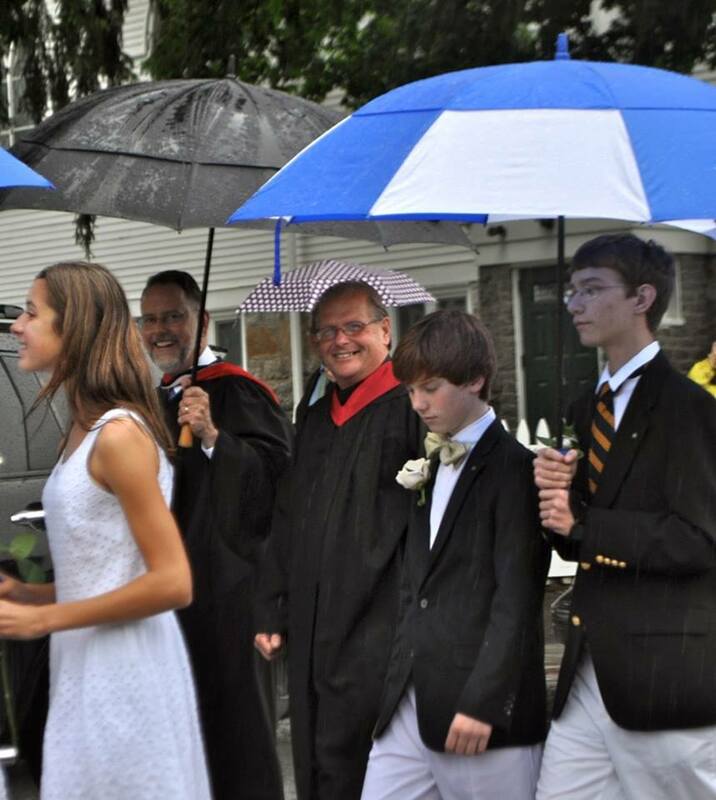 And we all marched jubilantly down to the church umbrellas in hand. The commencement address is referred to as the Derby Day Lecture -- in fact I gave the 222nd one in the school's history. To me the difference between an "address" and a "lecture" is about 40 minutes but fortunately for everyone involved I didn't go with my gut. In my experience, as with sermons, no one has ever complained about a commencement address being too short. I don't think I'll be replacing Oprah on the short list for Stanford or Yale next year but my mid-May calendar is pretty wide open at this point. I'm just disappointed I was awarded an honorary 8th grade degree. As many of you know, as a commencement speaker I’m not a completely objective observer -- I’m also the father of one of our graduates. And so my second thought after being asked to speak today was what a wonderful, unique, diabolical opportunity to publicly humiliate Ben. I recognized a chance to get him back for all the nagging about homework and all the chauffeuring around town and all the times I asked about how his day went only to be given the one word response: “fine.” For parents of middle schoolers much of life is lived on a “need to know” basis and there is evidently precious little that falls into that category. Okay, I promised I wouldn’t do or say anything too embarrassing -- I mean besides my mere presence. But as many of you know, Ben has a certain pet he likes to talk about. A lot. Mimi the ferret. In fact, I understand that Ben’s known to his classmates as the Ferret King. I am so proud of him for this that it literally makes me want to weep. But I did promise Ben and some of his friends that I would somehow work ferrets into today’s address. So here goes -- four pieces of advice based on why you should not act like a ferret. First, ferrets are sneaky. They like to abscond with things like keys and mittens and important papers like homework. So my first piece of advice to you is don’t steal things. Okay, graduates, that was your brief ferret shout-out -- I hope you enjoyed it. What this speaks to in this context is the importance of a strong foundation.Through your parents and your teachers and your classmates and your entire Derby experience, you have a solid foundation for the rest of your lives; a foundation built on rock. No one can take that away. And as the storms of life swirl -- and they will -- you can always trust in this foundation. This foundation that has been built by loving parents, gifted teachers, dedicated friends, and by your own hard work. This foundation isn’t complete of course -- it will be added to and fortified over the years. But much of this foundation is formed from the culture of support and honesty and creativity and love and care at DerbyAcademy. And it is a solid foundation upon which to build the rest of your lives. But if there’s only one thing you remember about this day, I’d like you to remember this -- it’s something that’s important as you enter high school and it’s something you need to live a full, fruitful, healthy, and successful life: find your passion. It doesn’t matter what it is -- playing the oboe or writing poetry or rugby or rock climbing or chess or chemistry. Experiment, try new things, challenge yourself, fail at some things and realize it’s all part of the learning process. If I am ever again in the audience at a graduation ceremony, I intend that somehow you must be the speaker. I almost skipped this but was curious enough to try and figure out who would have extended an invitation to you to speak at Derby Day in Kentucky seeing as how you're in Massachusetts, a fer-off piece from Kentucky. 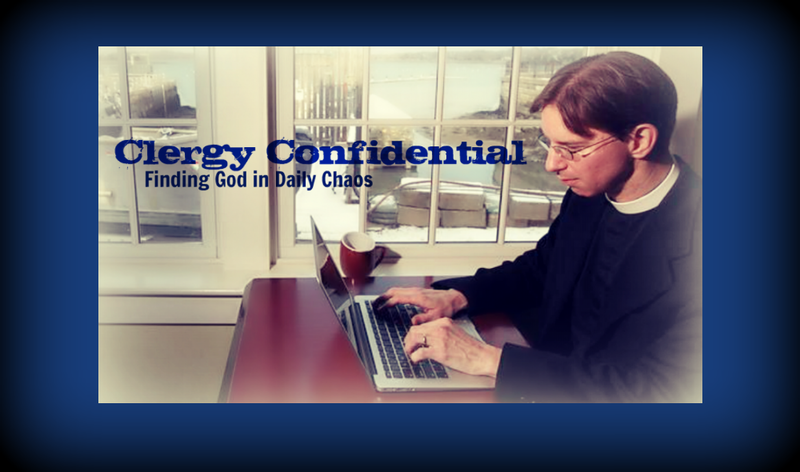 Also, your expertise is ferrets who live in parsonages, not Kentucky Derby race contenders...OK...and God...and LENT MADNESS. Just remember, you've got another son in the wings.